Here’s what you need to know about content marketing, why it’s so effective, and how it could help your brand grow. Content should be at the core of your company’s marketing strategy. It serves so many purposes, including allowing you to connect with consumers and showcasing the value of your product, and it’s rapidly outpacing more traditional marketing strategies. 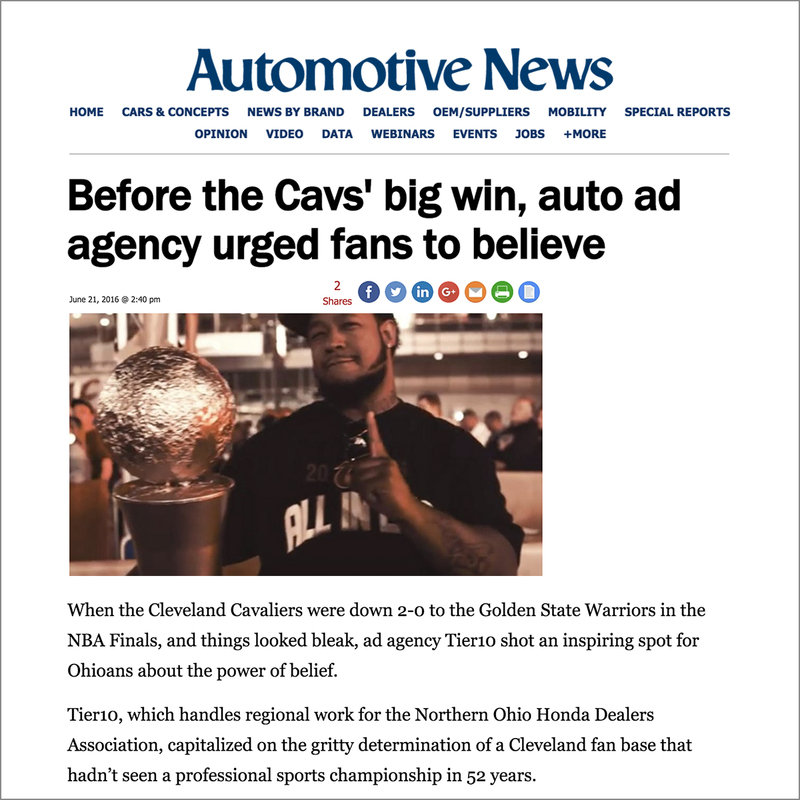 A perfect example of this strategy is Tier10’s work with the Northern Ohio Honda Dealers Association during the 2016 NBA Finals, which was featured in Automotive News. When the Cleveland Cavaliers were down 2-0 to the Golden State Warriors in the 2016 NBA Finals, Tier10 filmed and produced “an inspiring spot for Ohioans about the power of belief. …Tier10 capitalized on the gritty determination of a Cleveland fan base that hadn’t seen a professional sports championship in 52 years.” The ad’s footage was captured in downtown Cleveland near the Quicken Loans Arena when fans were preparing for Games 3 and 4. The ad was initially used as a pre-roll that launched a day before Game 4, targeting those in the Cleveland area who searched for LeBron James or Cleveland Cavaliers videos. After tweaking the spot in the following days, Tier10 geo-targeted Honda owners in the area through Facebook. The agency also retargeted consumers who visited the NOHDA website by advertising on other websites. Taking it one step further, Tier10 ran the spot on TV in the region before Game 7. The ad earned Tier10 a Davey Award and Telly Award. Another example of Tier10’s content marketing strategy is with the Greater Twin Cities Honda Dealers Association (GTCHDA) and its “School is Better” campaign. Each month throughout the school year, one of the eight GTCHDA dealerships presents a check of up to $5,000 to select schools within the dealership’s community. Check presentations are filmed and aired on regional TV, as well as shared on the association’s social media channels. To date, the GTCHDA has donated $30,000 to local schools. Why Does Content Marketing Matter Today? Content marketing costs 62% less than traditional marketing. Despite this decreased cost, it still manages to generate three times as many leads for companies that use it. Content creates 2.9x the conversion. Companies that use content marketing enjoy conversion rates that are six times higher than companies that don’t use content marketing. Coca-Cola spends more on content than traditional ads. As one of the largest brands in the world, this should demonstrate the exact importance of content marketing. The average length of a blog post today is 1,054 words or longer. This is up from 808 words back in 2014 and demonstrates the rising importance of long-form content. 60% of marketers produce a new piece of content daily. This just goes to show that if you’re not keeping pace, you’re falling behind. Long form content generates 9x the leads of short-form posts. Today’s customers are seeking out long-form, in-depth posts. Customers love content. Modern customers love content and require a great deal of fresh material to stay interested. Provide this for them to keep them coming back to your brand. What are the Different Content Marketing Strategies? Blogs are some of the best-known forms of content marketing. Blogs are hugely helpful not only for improving your SEO but for driving more organic traffic to your website. According to Forbes, websites that blog have 434% more indexed pages than those that don’t. In addition to the fact that Google loves new content, businesses with blogs earn more inbound links, more new customers, and more sales than companies without blogs. Videos are a rapidly-growing form of content marketing. As the world becomes increasingly visual, marketers are turning toward video content in rising numbers. Customers today view more video material than ever before, and brands that want to keep pace are getting proactive about creating it for their customers. According to some experts, brands that use video enjoy an average of 157% more traffic from search engines and a 105% increase in time spent on the website. Combining the best of both the visual and textual worlds, infographics pack an informative punch for people who produce and consume them. Perfect for promoting social shares and similar approaches to marketing, infographics are a highly visual form of content that provide real value to customers. If you choose to use infographics to create content for your company, it’s wise to hire a professional. Infographics require some design expertise to create and will benefit your company the most when they’re well-done. Case studies are fantastic for showcasing your services to your customers and helping people understand what your business does best. To draw more new customers into your practice, create case studies that showcase your skills, the results you produce for other companies, and how you help specific clients or companies. It’ll be just the confidence boost customers need to take the leap. Content marketing is a high-quality approach that can benefit virtually any modern company. As a wide-ranging approach that includes many different outlets and opportunities, content marketing stands out as one of the most efficient and approachable forms of marketing. Whether you’re looking to improve your ROI, attract new customers, showcase a new product, good, or service, or simply expand your reach, content marketing is exactly the approach to get the job done. Fortunately, content marketing is also one of the most accessible forms of marketing. Access it by creating infographics, writing blogs, engaging on social media, or producing videos for your customers. There are dozens of ways to skin the metaphorical cat, and your brand can’t afford to miss out. For more information about Tier10, visit Tier10.com. Error - Error validating access token: Session has expired on Tuesday, 06-Feb-18 09:00:00 PST. The current time is Thursday, 25-Apr-19 12:43:09 PDT.